We updated this easy-to-understand brochure with revised content, including a section highlighting our new Aboriginal publications. how to get legal aid or other legal help. Previous editions of this brochure are no longer current; please recycle. We’ve updated four of our criminal law booklets: Representing Yourself in a Criminal Trial; Defending Yourself: Breach of a Court Order; Defending Yourself: Theft Under $5,000; and Speaking to the Judge Before You’re Sentenced. We’ve revised design and content in each, including three attractive new covers. All of these plain language booklets help an accused person represent themselves in a criminal matter. Available in print and online. On November 6, 2016, Brad Dean was hit by a car and killed, while cycling on River Road in Richmond. Two other cyclists were seriously injured as well. On the anniversary of his death, hundreds of cyclists gathered in Stanley Park for a memorial ride. Just days afterwards, Crown Counsel announced that they would not be laying criminal charges against the driver of the car. Instead, he was charged with driving without due care and attention under the Motor Vehicle Act of British Columbia. The decision not to lay criminal charges has been controversial. We cannot comment on that particular decision. Among other reasons, we do not have all the information available to Crown Counsel, and it would not be appropriate for us to offer an opinion. We can however provide some general information about how those decisions are made. Please bear in mind that what follows is an outline of the general process. It is not a guide to how the law applies in a particular case, as that depends on the charge, the facts of the case, and the law. Criminal offences generally require proof of an act (conduct) that the law treats as a crime, and a criminal intention. If someone is found guilty of a crime, the sentence (punishment) is often – though not always – more severe than for other types of offences, and there may be other consequences for the person convicted of the criminal offence. When police complete an investigation, they present a Report to Crown Counsel. They summarize the evidence gathered and usually propose the laying of a charge or charges. whether a prosecution is required in the public interest. Crown Counsel’s charge assessment is a legal determination and it requires skill and experience on the part of Crown Counsel. They can only prosecute a case when there is a strong, solid case to put before the court. When they’re deciding whether a conviction would be likely, Crown Counsel evaluates the evidence to see what would be admissible, what weight that evidence would have, and what possible defences there might be. Crown Counsel must be satisfied there is a substantial likelihood of conviction before considering the public interest. This is laid out in the Crown Counsel’s Charge Assessment Guidelines (PDF). It would be wrong of Crown Counsel to prosecute a case that does not meet the charge assessment guidelines. Finally, it’s worth remembering that the person charged is presumed innocent. Crown Counsel can’t just prove that they probably committed the crime; the charge has to be proven beyond a reasonable doubt. This is a different and more demanding standard than the balance of the probabilities that would apply, for example, in a lawsuit asking for compensation for an injury. If you want to learn more about how Crown Counsel makes their decisions you can look at the BC Crown Counsel Act, which is the law that establishes their function and responsibilities, and the Charge Assessment Guidelines found in the Crown Counsel Policy Manual (PDF). And for more information on how criminal charges are laid, you can also look at this Dial-A-Law script, published by the Canadian Bar Association, BC Branch. People who identify as Aboriginal have Gladue rights under the Criminal Code of Canada as a result of their unique circumstances in Canada. This means that when an Aboriginal person is being sentenced, the judge must apply Gladue principles and take into account the factors that may have brought that person before the court. The Aboriginal person can give the court information about themselves and their family history in a Gladue submission to help the judge decide the best sentence for them and their community. Our plain language booklet, Gladue Submission Guide, is a new resource to help Aboriginal peoples, lawyers, Native courtworkers, and advocates to prepare a Gladue submission for court. The booklet explains Gladue rights, what happens at a bail or sentencing hearing, and what’s in a Gladue submission. It includes a Gladue factors checklist and a worksheet to gather the information needed to prepare a submission. In the worksheet, the Aboriginal person can give details about the Gladue factors that shaped their life and the restorative justice options that may help them address the issues that brought them before the court. 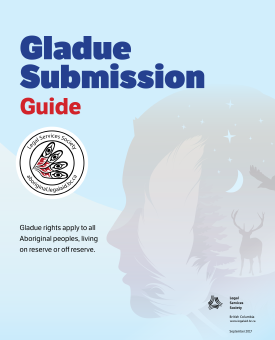 The Gladue Submission Guide is one of four new LSS Aboriginal publications about Gladue rights and First Nations Court this year. The other three are Your Gladue Rights, Gladue Rights at Bail and Sentencing, and What’s First Nations Court? To find out more about Gladue rights, see the Aboriginal website. Is That Legal? is available in print and online. All the new translations are available online-only on the MyLawBC website. Thank you to the Francophone Affairs Program in BC for funding these translations, made possible through the Canada-British Columbia Official Languages Agreement on French-Language Services. See the MyLawBC website for a full list of all our French PLEI publications. See below for links to the latest new or revised French publications. This booklet is for people facing serious and complex criminal charges who have been denied legal aid but can't afford a lawyer. It explains why, how, and when to ask the judge to appoint a free lawyer. The booklet includes a checklist of points to cover in court and copies of the necessary court forms. This pamphlet outlines in plain language what legal aid is, and how and where to apply for it. It also lists the phone numbers of legal aid offices in BC. This booklet describes how to defend yourself if you’re charged with possession of an illegal drug. It includes what the prosecutor must prove to find you guilty, sentencing information, and how to get legal help. There’s also a flowchart showing how LSS publications can help at each stage of the court process. The booklet explains what happens when an accused person wants to plead not guilty to a summary offence. It’s designed to guide a self-represented person through the basic steps in the court process both before and at a trial. It contains checklists, flow charts, and a sample letter to Crown counsel, as well as how to get legal help. Previous editions of this pamphlet are no longer current; please recycle. All the new translations are available online (only) on the MyLawBC website. Thank you to the Francophone Affairs Program in BC for funding these translations, made possible through the Canada — British Columbia Official Languages Agreement on French-Language Services. See the MyLawBC website for a full list of all our French PLEI publications. See below for links to the latest new/revised French publications. Back in stock! We’ve reprinted four booklets (with minor revisions) in the popular Defending Yourself series: Assault, Breach of a Court Order, Mischief, and Possession of Property Under $5,000 Obtained by Crime. This series describes how to defend yourself if you’re charged with a crime and what the prosecutor must prove to find you guilty. The booklets also include sentencing information and how to get legal help. The previous 2013 editions are still legally accurate. If You Can't Get Legal Aid for Your Criminal Trial has been revised and reprinted. (This publication was previously called If You Can't Get a Lawyer for Your Criminal Trial.) This booklet is for people who face serious and complex criminal charges but have been denied legal aid and they can't afford a lawyer. This booklet explains how to make a Rowbotham application -- how to ask the judge to stay your charges until the government gives you funding for a lawyer. The booklet explains what you have to prove, how to prepare for court, and what happens in court. It has the forms you need to make a Rowbotham application and includes instructions on how to complete them. Note: The previous edition of this booklet is no longer current; please recycle. We’ve revised and reprinted Speaking to the Judge Before You’re Sentenced. The brochure now has a new design and minor revisions to the content. It outlines in plain language the possible sentences for someone who pleads guilty or a judge finds guilty at trial. It also describes what a convicted person can say to the judge before the judge decides on a sentence. Available online and in print. How to Appeal Your Sentence and How to Appeal Your Conviction have been reprinted with minor revisions. These booklets explain how to appeal your sentence or conviction for a summary or indictable criminal offence without a lawyer’s help. They explain how to prepare for the appeal and contain removable blank forms. Note: The previous edition of these booklets are no longer current; please recycle. All the new translations are available online (only) on our website. See our website for a full list of all our French PLE publications. See below for links to the new/revised French publications.